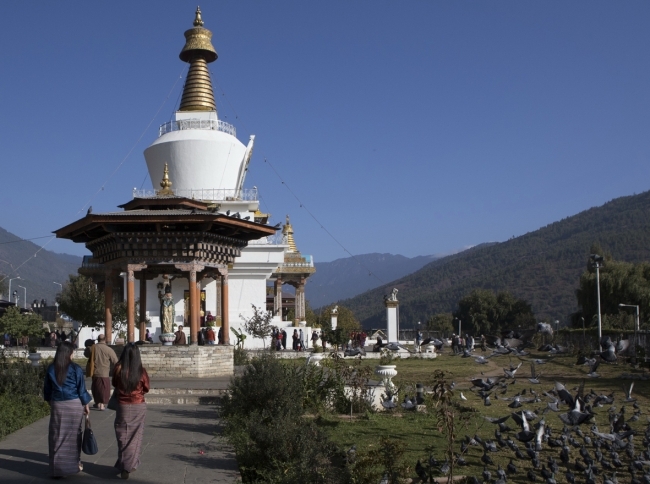 This 12 day tour is the definitive Bhutan tour. Starting from Kathmandu, you will fly to Paro in Bhutan and then spend 10 days traversing the valleys of Paro, Thimpu, Punakha, Wangdue, Trongsa and Bumthang soaking in Bhutanese history, culture, architecture, Buddhism and a way of life that places a very high premium on happiness and well-being. In Thimpu you will visit the memorial Chorten (cairn) for King Jigme Dorji Wangchuk, the Dupthop Lakhang Nunnery, the National Library, the Thangka painting school, the traditional Medicine Institute, the Lungtenzampa where smiths plying traditional methods make silver jewelry, the traditional Bhutanese paper factory. A short drive will deliver you to Punakha, home to the Chimi Lakhang the ‘fertility’ monastery dedicated to Drukpa Kuenley, popularly known as the ‘Devine Madman’ and his sexual prowess. An approximately six hour drive will get you to Trongsa via the Pele La (3300 m.) from where, on a clear day, majestic views of Mt. Chomolhari (7314 m.) are available. In Trongsa, visit the Trongsa Dzong (Fortress) and Chendebji Chorten amidst stories of demons that were cast and trapped under it. A leisurely drive will get you to Bumthang via the Choeker Valley and Yatung La (3400 m.). In Bumthang visit the Jambay Lakhang where you will be able to witness the ‘Fire Blessing’ ritual where all sins are absolved by jumping over a fire! Also visit the Kurjey and Padmasambava Lakhang where the Guru Rimpoche is said to have meditated in the 8th century. Leaving Bumthang you will travel to the valley of Wangdue Phrodang where you will visit the Gangtey Gompa. Return to Paro visit the Drukgyal Dzong and National Museum followed by a memorable hike to the Taktsang Monsatery and return to Kathmandu for catch your flight home. Day 02 In Kathmandu to make last minute preparations for your trip to Bhutan. If you are sufficiently prepared then sightseeing of Patan Durbar Square, Swoyambhunath and Boudhanath. Day 05 Drive to Punakha. Visit the Chimi Lakhang. Day 07 A Short drive will get you to Bumthang via the Yatung La (3400 m.) where you will visit the Jambey Lakhang and witness the "Fire Blessing" ritual. Day 09 Drive to Wangdue via Gangtey and sightseeing. Day 10 Drive to Paro via the Dochu La and the Simtokha Dzong. Day 11 Morning sightseeing of the Drukgyal Dzong and the National Museum before setting off on a short but, intense hike to the Taktsang Monastery. Day 12 At an appointed time, transfer to the airport and fly to Kathmandu. Additional sightseeing in Kathmandu. Day 13 At an appointed time, transfer to the airport for your departure from Nepal.